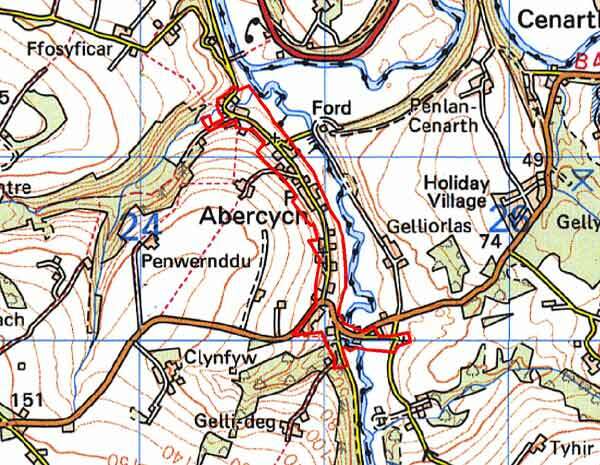 A small, narrow area within modern Carmarthenshire and Pembrokeshire, comprising the industrial hamlet of Abercych, which is represented by 19th - 20th century linear development along the Afon Cych near its confluence with the Afon Teifi. The Cych forms the boundary between the two counties, consequently the medieval and later history of the area is rather different either side of the river. 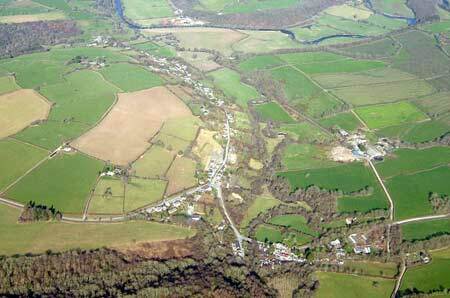 The Afon Cych divided the medieval Cantref Emlyn into two commotes, Emlyn Uwch-Cych and Emlyn Is-Cych. Emlyn Is-Cych, to the west of the Cych, was brought under Anglo-Norman control in c.1100 when it was reconstituted as the Lordship of Cilgerran. However. it may not have been fully subdued and it was back under Welsh control by the 1130s, where it remained throughout the 12th and early 13th centuries. It was appropriated by the Anglo-Norman Marshal Earls of Pembroke in 1223, but was granted to Maredudd ap Rhys, with whose family it remained until finally annexed by the English crown in 1283. In 1536, it formed part of the Hundred of Elvet in Carmarthenshire. Emlyn Is-Cych to the east remained a marcher lordship, with intermittent periods of Welsh rule, until the late 15th century when it passed to the crown, eventually being incorporated into Pembrokeshire (Cilgerran Hundred) in 1536. Nevertheless, the area in general remained subject to Welsh tenurial patterns which have been largely responsible for the dispersed settlement. Indeed, no settlement is recorded in the Cych valley until the establishment of a forge, now gone, at Forge Cych at the bottom of the valley. The forge became the focus for settlement, mainly comprising worker houses. By the time of the tithe surveys of the early 1840s the settlement consisted of about 30 houses spread along the valley side. Two chapels were built to serve this community during the 19th century, and an iron church, now closed, was added in the 20th century, testifying to the importance of the new community. Development of the settlement, with further service industries, has continued through the 20th century and into the 21st century. Abercych is a very small, built up historic landscape character area mainly lying on steep east- and northeast-facing valley sides of the Afon Cych, between 10m and 30m above sea level. 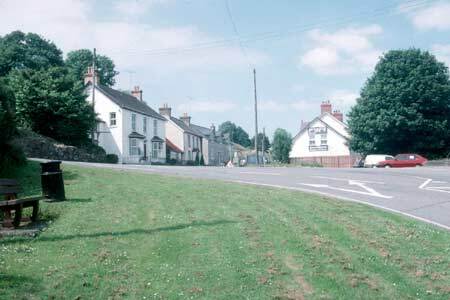 It is a linear village, or rather an amalgam of several hamlets – Pont Hercws, Forge Cych, Abercych, Penrhiw and Pont Treseli – spaced along a minor road that runs along the steep valley sides and down onto the floodplain of the Cych alongside the B4332. Owing to the steep slopes houses are either located on terraces cut into the hillside upslope of the road or built out over the valley side on the downslope side. Most dwellings are worker houses dating to the later 19th century and built of uncoursed Teifi valley slate. This is either left bare or cement rendered. North Wales slate is the most common roofing material. There is a mixture of building styles, but most houses are two-storeyed and three-bayed - as terraces, semi-detached and detached houses – with brick door- and window-jambs complementing the stonewalls. Much modified single-storey cottages are present, as are some late 19th century detached, slightly larger workers’ houses with period details such as bay windows and bargeboards. At Pont Hercws, a now disused single storey cottage with corrugated iron over thatch, perhaps dates to the early 19th century and is an indication of the type of building replaced by those described above. At least one old smithy survives indicating the industrial origins of this settlement. Buildings to serve the community include two 19th century stone-built chapels (one listed), the 20th century iron church of St John, and two public houses. Many of the former open spaces between the 19th century houses have been filled by late 20th century and 21st century detached houses; this process is continuing. Pont Treseli, a 19th century road bridge is a listed building. Recorded archaeology consists of some of the buildings described above and documentary references to Forge Cych.